When Zelko Rezler and his partner Alan Minello started their tool and die business in 1996, they set out to differentiate themselves by providing top-quality tools that would be long lasting and require minimal maintenance. Over the years, the company has earned a reputation for delivering on this promise. Serving primarily Tier One automotive suppliers, Rezmin has been challenged by low-cost competition from overseas shops. Still, the overseas alternative and the downturn of the economy continue to place a constant pressure on Rezmin Tool & Die, in Oldcastle, Ontario, Canada, to reduce the cost of its tools while increasing the speed of delivery and maintaining its quality standards. This constant cost pressure and lack of accurate estimation tools also have made quoting more challenging. Rezler spends 5 hr./day working on quotes. Among the newer CNC machines acquired by Rezmin Tool & Die is this DMG five-axis CNC universal milling machine, which boasts a swivel rotary worktable, digital drives in all axes and a motor spindle speed to 18,000 RPM. 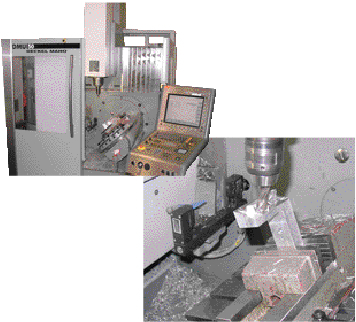 Programming the machine with Cimatron software has reduced setup and machining time by as much as 65 percent. The company has invested in CNC equipment to eliminate much of the handwork processes, and outsourcing of die sets. Producing die sets inhouse has returned as much as a 50 percent cost savings. To take on this work, Rezmin purchased four seats of die design and build software (from Cimatron) in its engineering department, and three seats on the shop floor. Also, die makers on the shop floor use two additional seats of Cimatron Viewer. The firm also uses Cimatron Fikus software to create wire-EDM programs directly from the 3D design data. “Eliminating the need to translate the data has simplified the data flow. It makes wire programming less labor intensive and more accurate,” adds Rezler. To further increase efficiency and speed, Rezmin added four- and five-axis machines to its shop, for boring, drilling and tapping holes on multiple compound pockets. According to Rezler, programming the new machines with Cimatron software has reduced setup and machining time by as much as 65 percent. Rezmin’s programmers take advantage of the Cimatron auto drill function to define sequences for different types of holes and pockets. “The ability to define templates for cutting procedures is a huge timesaver,” adds Rezler. Mr. Rezler recently participated in a webinar hosted by MetalForming and PMA, where he speaks eloquently about his firm’s ability to compete with low-cost countries. To listen in, access the archived webinar at www.metalformingmagazine.com—click on the Multimedia Center link. Article provided by Cimatron Technologies, Inc., Novi, MI: 248/596-9700; www.cimatrontech.com. Finally, the Cimatron viewer seats on the shop floor provide machine operators with direct access to the part data, so they can pull sizes and dimensions directly from the 3D assembly. As a result, detail prints are no longer needed for most parts and components, helping Rezmin run a greener and leaner shop floor operation.